Our printable receipt for a loan payment is easy to edit to suit your requirements. Issuing a receipt form is good practice and may be of great benefit in case of a dispute. Where a single payment is made in full and final settlement of a loan amount - such as in a demand promissory note - a promissory note release should also be issued as well as the original Note returned to the borrower. Where weekly / monthly / yearly payments are made, a receipt should be issued for every payment made. 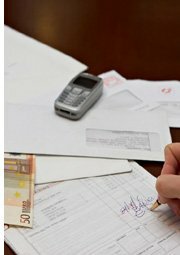 After receipt of the final payment a Release of Promissory Note can be issued and the original note returned. Some site visitors mention that they get a blank form when clicking the Print button at the end of the form. Unfortunately not all browsers/printers render the same - you may have to click on a "Open PDF in preview" button on your printer's interface and then select the page with the text on it to print. A better alternative is to highlight the text and then Copy-Paste this printable receipt of payments into your word program, edit the Note details and print a couple of receipt forms to issue when payments are made. Important Note: Please refer to our Promissory Note main page for guidelines and links to a Promissory Note Release, Notice of Default, Personal Loan Agreement and more free promissory note forms. All our free legal forms are sample documents and are provided for general informational purposes only. It is important to consult with an attorney to ensure your documents meet all the legal requirements in your jurisdiction. in the original amount of $___________(__________________________________________). as payment in respect of the Note referenced above. As per the terms of the Note all payments shall first be applied to interest accrued to date and thereafter to the principal amount. The remaining unpaid balance on this date is $________(_________________________________). Signed on this ____________day of ____________________________20______.